One of the unsung features of all our Welsh Overland Safari’s are the various church’s and chapels we pass (and often stop and visit whilst out and about in the “luxury” mini bus)! 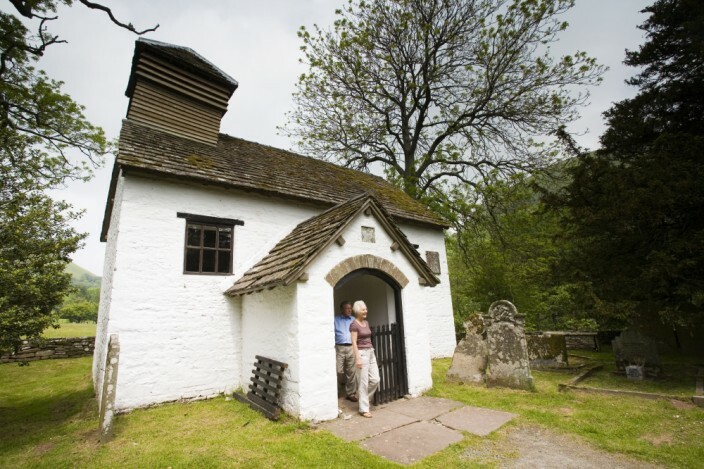 For instance on our popular Abergwesyn Pass tour we stop at the most remote chapel in Wales; Soar y Mynydd in the heart of the Cambrian Mountains and on our tours of the Brecon Beacons we visit St Martins church in Cwmyoy and the Church of St Issui in Patricio (our very own leaning tower). So in this mini series we will feature a church or chapel on our tours. The first of which is the Church of St Mary the Virgin in Capel-y-Ffin near Hay on Wye which can be accessed on our Central Beacons Tour! St Marys Chapel was built in 1762 on the site of a medieval place of worship and pilgrimage. Two headstones by Eric Gill can be found in the churchyard. So what makes this chapel so special? It recently featured on Will Milards, Hidden Wales series; According to legend, a vision of the Virgin Mary appeared to a Norman lady whilst she was in the field in which the church now stands.